Circle 25 Diameter. 4/6 Footballs. Two players enter the centre circle. Remaining players set up equally around outside. 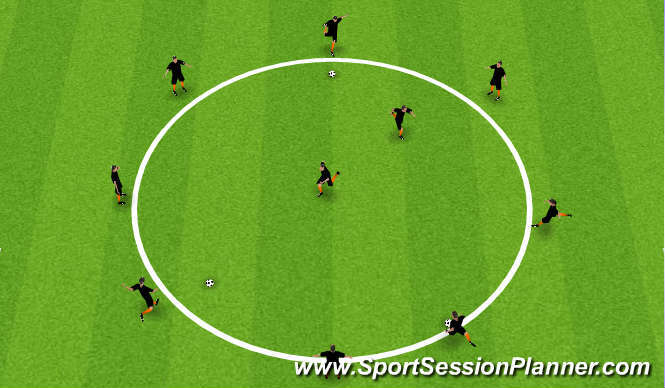 Outside players pass the ball through the circle, with the aim to hit the two central players below the waist. Central players must dodge the ball. If pair get hit, new pair enter the circle. Outer Players to play 2/3 touch. Keep ball low to increase chance of hitting central players. Central Players may only move by hopping or jumping. Make circle smaller or bigger depending on success rate. Between 6 and 10 5 x 5 boxes scattered around area. Two / Three Balls in each box. Players start in playing area. Players must collect a ball from one box, and then immediately transfer it to another box as quickly as possible. Players must then move to another box and repeat. Players must avoid the obstacles / other players by using different dribbling techniques and turns. Players must work with both feet throughout the practice. Players must use a variety of turns and tricks in the area to change direction. Players must not travel in a straight line. Work at a high tempo and quality throughout the practice. 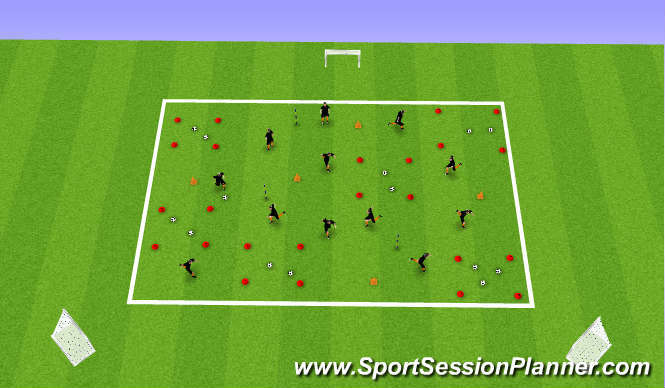 Players must perform toe taps / toggles / kick ups when leaving a ball in a box. 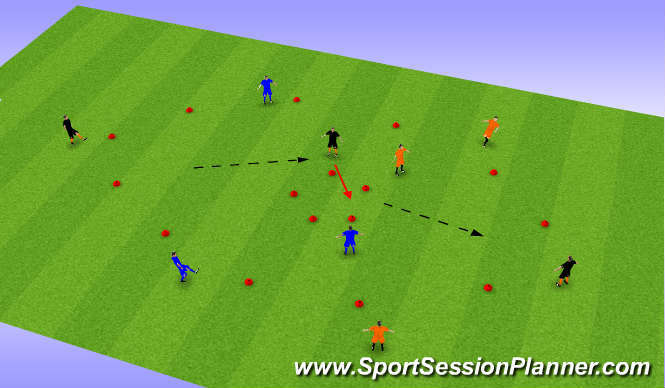 Players must dribble through one box before moving to a different box. Players earn a point for every ball they transfer. A safe player can be added, who can be used to play a one two with or as an option if under pressure from multiple defenders. Player on outside passes into central player who turns and lays off to other teammate outside. Two teams of five players, each allocated to one area. 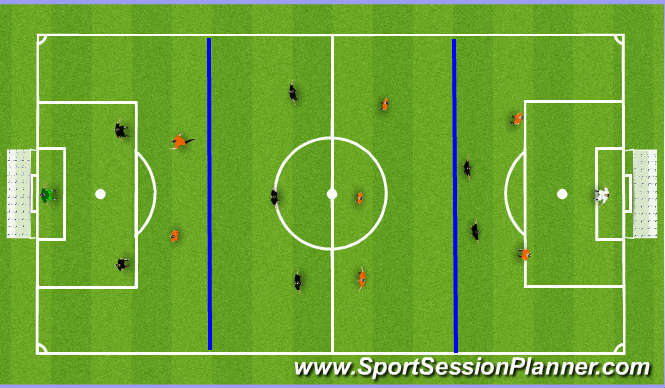 Ball starts in zone A, with Oranges playing 5 v 3 blacks. Oranges must play 10 passes before team can break away and try and score a goal. Blacks must try and win the ball, and swtch play into the opposing wide area. 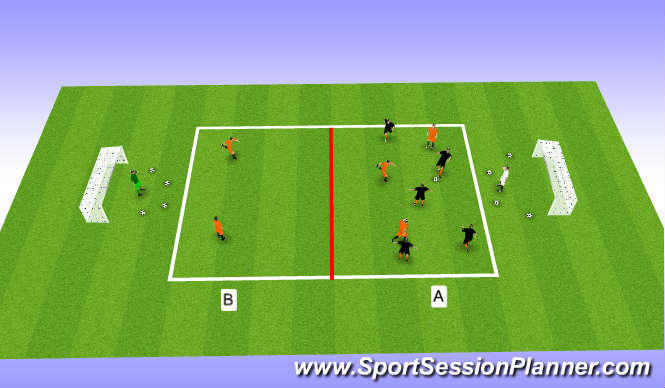 Upon doing this, blacks play 5 v 3 with 3 Oranges coming across to press the ball. GK can be used to maintain possession. Number of touches required, moving the ball quickly with two / three touches. Angles of support and movement off the ball to create space for team mates. Defending Team to press the ball and win it back as quickly as possible, before transferring it to their side in order to create overload. Players should work to the highest standards throughout. Players should work with a high tempo whether with possesion of the ball or trying to win it back. Players can be limited to playing two touch / must have a touch with either foot. When attacking team enter opposing half, they must remain balanced and organised. Teams can play throw ins when the ball goes out of play. Players are allocated zones in which they must play. If a player breaks out of their zone, a free kick is awarded to the other team. As the game progresses, players are allowed to enter multiple zones. Game Condition - Player can enter a new zone if they pass the ball into that zone.